Current mirror date: 2019.02.27 This page is a mirror of the Feature Tracking page on the NFV private wiki. Information on the private wiki page is frequently updated, whilst the present page is regularly mirrored. Links to contributions will require authentication with an ETSI Online Account. Some introduction will be put here including guidelines, process description and tutorials. Note: Agreed content can be added to Pseudo meeting --> If the access is restricted, this may only work within a workgroup. Related/Dependent Features: Please indicate other features which relate to the ongoing work. Details can be given in the implementation plan or in the issues section. Detailed description what has to be done in which work item. Timeplan of when the team plans to conclude a particular action in the implementation plan. List of issues raised based on the feature implementation. List of security considerations implied by the feature. Feature description This feature addresses the initiation and the coordination of the software modification process related to VNFs. Goal is to minimise the impact of software modification on service availability. 001 Add functionality description of VNF software modification synchronisation in to IFA010. Feature Prime Maria Toeroe, Ericsson. Feature description This feature addresses the support for the coordination of the NFVI software modification process with the VNFs hosted on the NFVI in order to minimize impact on service availability. 001 Based on REL006 add functionality description of NFVI software modification support to IFA010 for the VIM, VNFM and NFVO. 006 Specify the interface for the coordination of the NFVI software modifications with the hosted VNFs on the Or-Vi reference point. 007 Specify the interface for the coordination of the NFVI software modifications with the hosted VNFs on the Vi-Vnfm reference point. 008 Specify the interface for the coordination of the NFVI software modifications with the hosted VNFs on the Ve-Vnfm reference point. 009 Specify the interface for the coordination of the NFVI software modifications with the hosted VNFs on the Or-Vnfm reference point. 010 Specify the VNF constraints parameters for NFVI software modifications in the VNFD. Feature description The present enhancement proposes adding the capability to the NFV-MANO architectural framework to support the reservation of compute hosts (see clause 3.1 in GS NFV-PER 001) in the NFVI. NOTE: below contributions are marked as "OBSOLETE" as all content has been migrated to the MegaCRs (see above) and FEAT04 has been approved at IFA#101. 001 Specify a requirement for the VIM to support the capability of handling reservation of resources at the host level. Specify a requirement for the NFVO to support requesting the reservation of resources at the host level. 002 Specify requirements for an interface specialized on NFVI management on the Or-Vi to support the reservation of resources at the host level. 003 Specify an interface and its operations to support the reservation of resources at the host level. 004 Extend Annex A.2 to introduce physical compute host reservation. 005 Extend clause 6.3.2 Grant VNF Lifecycle Operation operation. - Specify a requirement for the VIM to support NFVI capacity management. - Specify a requirement for the NFVO to support NFVI capacity management. 007 Specify an interface (IFA005, clause 7.X) and its operations to support Compute Hosts Capacity Management. 008 A new interface and its operations may be needed in IFA013 for notifications from the NFVO related to resource capacity shortage. The latest version of NFV EVE Network Slicing Report (EVE012 V3.1.1) can be downloaded at EVE012. Support Network Slicing by defining the necessary requirements and enhancements of interfaces, as discussed in NFV(17)000252. Related/Dependent Features After analysis and LS exchange with 3GPP no dependencies for the time frame of this feature are seen anymore. Based on 3GPP's answer below, FEAT05 assumes that current NS LCM can be used by slicing to build slices and slice subnets. Based on 3GPP's answer below, FEAT05 can concentrate on analysing the use of NS priority only. Based on 3GPP's answer below, FEAT05 expects that a NS instance doesn't need to keep track of different consumers of a NS instance, but the existing multi-tenancy concept can be used by 3GPP. Based on 3GPP's answer below, FEAT05 closes the work on slice specific policies and multi-domain issues. It is expected that Slice management functions can build the slices by using (instantiating) NS instances. NFV MANO is not aware of the network slices. Thus slice consumers / tenants are not known by MANO. Only the NS tenant is seen. Depending on the use cases (contributed to an Annex for IFA010), it will be decided whether NS priorities need to be propagated to VNFM or VIM. 3GPP relies on the use of ETSI NFV NS concept. Current expectations are for the support of priorities at the NS level (e.g. expressed as attribute value in the NSD). Fixed mapping of slice tenant and NS tenant was not explicitly confirmed. Keeping track of multiple consumers doesn't seem to be necessary. 3GPP is aware of the NS tenants and will use the concept by some mapping between the slice consumer and the tenant of supporting NS(s). According to the answer, 3GPP is not planning to share NS instance between two slices if isolation is needed. 3GPP expects that slicing management will use Os-Ma-nfvo and Ve-Vnfm-em reference points only. There should be a top priority, i.e. one that cannot be pre-empted. SA5 prefers the priority as attribute in NSD-DF. 2.1.1: “3GPP will expect to receive a notification” might be understood that the consumer will receive the notification. 2.1.3: “For LCM actions on NFV NSs that potentially impacts 3GPP communication services, MANO should ask permission for such LCM actions the 3GPP management system and not use the provided NS priority” is unclear in the wording. What should MANO use instead if it shouldn’t use the priority? 2.1.3: It is unclear how NFV should know which NS would impact 3GPP communication services and not be allowed to use the priority. 2.1.4.1: 3GPP doesn’t acknowledge here that there might be other consumers for NS/resources that may use resources and need to be considered in the setting of priorities. 2.1.4.2: The wording allows also pre-emption in case a low priority NS instance is fully instantiated. Does 3GPP intend this or do they refer only to NS LCM operations being in execution at the same time concurrently? Should MANO use priority during autohealing and “kill” a low priority NS instance to be able to heal a high priority NS instance in a resource shortage situation? 002 Identify and add new parameters for NSD to allow support of the network slice and network slice subnet. Use cases will be covered in IFA010, Touchpoints in IFA024. Not necessary to re-open Document in drop 2.
all reliability aspects will be analysed and covered by the REL010 work item. Impacts on IFA documents cannot be analysed in drop 2 time frame. Thus these can only be done (if necessary) in a second phase of FEAT05. 011 The touchpoint between NFV and network slice management functions needs to be specified. This evaluation was approved in SEC WG call on January 24, 2019 as NFVSEC(19)000008r1_FEAT05_security_considerations.zip and finally approved by IFA WG in IFA#136 on January 30, 2019. Feature description An NS Package is an archive including the meta-model descriptors NSD and other files (scripts, security materials, possible rules, policies, NS over multi-tenants, etc. ), that are required to manage an NS from design to test/verification to validation/certification to runtime management; the holistic end-to-end NS lifecycle, as discussed in NFV(17)000247. Impacted WIs IFA010, IFA012 (TBC), IFA013, and IFA014. Note-1: We identify the impacted specifications in IFA WG only. 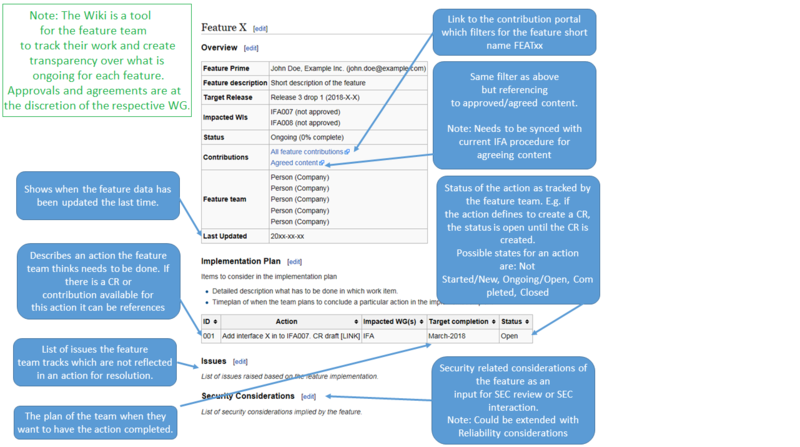 The impacted specifications in other WGs (e.g. SOL, TST, SEC, REL, etc) needs to be addressed separately and the chairs of SOL and TST WGs have been informed. We will follow up the impacts on SEC and REL WGs. Note-2: The impact on IFA012 is dependent on the ISG's decision whether IFA012 is released as GS or GR by the end of Y2017. New Specification No new WI is expected in IFA WG. The scope of this work item [DGS/NFV-SOL007] is to specify the Network Service Descriptor file structure and naming conventions for the different files, fulfilling the requirements specified in ETSI GS NFV-IFA 014. The work item deliverable will contain normative provisions. WI Status [In Progress; to be completed by 1H-2019]. 001 Add use case description of NS packaging to IFA014 Annex. 002 Update the NS packaging requirement in IFA014.Add a new clause 5.X to describe the NS packaging requirement, including the NS packaging structure, content, identification, integrity, etc. 003 Update the functional requirements on NFVO in IFA010. Add new functional requirements on NFVO about NS package management by either adding a new clause (e.g. 6.6.X) or updating the existing clause (i.e. 6.6.1). 004 Update the interface requirement on NSD or NS package management interface in IFA013. Add new requirements of NS package management interface by either adding a new clause (i.e. 5.3.X) or updating the existing clause (i.e. 5.3.1). 005 Update the existing NSD management interface or add a new NS Package management interface in IFA013. Add new operations and notifications related to NS package management interface by either adding a new clause (i.e. 7.X) or updating the existing clause (i.e. 7.2). Current PNFD management may be updated as well based on the requirement discussion in action #002. 006 Update the NSD management related chapters in IFA012, if the IFA012 is released as GS in Rel.2. ->Current PNFD has its own management operations, e.g. On-board PNFD, etc. ­->After the concept of NS package enhancement is introduced, the issue of merging them into NS package management operations needs to be addressed. ->The issue of backward compatibility with current NSD management interface needs to be addressed. •The impacts on SOL WG have been discussed. While the impacts on TST, SEC and REL WGs need to be discussed. List of security considerations implied by the feature (to be determined). NOTE:Contributions are marked as "OBSOLETE" as all content has been migrated to the corresponding MegaCRs. 2. IFA028 report has already provided the flows for reference. Lei Zhu (Huawei Tech (UK) Co., Ltd.
Ulrich Kleber (Huawei Tech (UK) Co., Ltd.
- Make relevant changes to the scope and overview sections to include the support for Multi-site Service on Os-a-Nfvo reference point. - Discussion for IFA032 may take more time than CRs but finalise before the 1st drop of Release 3. Feature description Following the recommendations written in ETSI GR NFV-IFA 021, this feature will enable the management of the NFV Management and Orchestration functional blocks identified by the NFV Architectural Framework. 001 Specify high-level requirement for the NFV Architectural Framework to support the management of NFV-MANO functional entities. 002 Specify a requirement set for the NFVO, the VNFM, as well as the VIM as a managed entity to support NFV-MANO fault, performance, configuration and information, state and log management by a managing entity. 003 Skeleton, scope and introduction description for the new deliverable. 004 Add description of the general framework and interfaces for NFV-MANO management using as a reference “Solution D” and “Solution E” descriptions available in clauses 7.1.4 and 7.1.5 of ETSI GR NFV-IFA 021. - NFV-MANO log management interface. 006 Specify the NFV-MANO functional entity information elements that will be reused in multiple interface definitions using as a reference the “Solution A” description available in clause 7.1.1 of ETSI GR NFV-IFA 021. 007 Specify the interface for NFV-MANO configuration management using as a reference the “Solution F” description in clause 7.1.6.5 of ETSI GR NFV-IFA 021. 008 Specify the interface for NFV-MANO performance management using as a reference the “Solution F” description available in clause 7.1.6.4 of ETSI GR NFV-IFA 021. 009 Specify the interface for NFV-MANO fault management using as a reference the “Solution F” description available in clause 7.1.6.3 and the fault reporting information modelling in “Solution B” in clause 7.1.2 of ETSI GR NFV-IFA 021. 010 Specify the interface for NFV-MANO state management using as a reference the “Solution F” description available in clause 7.1.6.6. 011 Specify the interface for NFV-MANO log management using as a reference the “Solution F” description available in clause 7.1.6.7. 012 Specify the definitions of performance metrics using as a reference the “Solution C” description available in clause 7.1.3 of ETSI GR NFV-IFA 021. 013 Resolution of editor's notes and final review of the document draft. 014 Review of security aspects. Security-related editor's notes are available throughout the IFA031 GS draft. The contributions needed to resolve those editor's notes which are specific to security topics will be listed here. Word version of the implementation plan in contribution NFVIFA(17)000897r1 (check for latest revision). It is very likely that the information contained in this wiki is more recent and updated more frequently. CLOSED: Action 004: description is deemed complete, but needs to be checked with some additional clarification or references to possible informative flows are needed. Status: completed. Additional content was added as part of action 013. CLOSED: Action 007: main content is available and approved, but some editor's notes need to be resolved (see action 013). CLOSED: Action 008: main content is available and approved, but some editor's notes need to be resolved (see action 013). Status: completed. Contributions addressing the editor's notes have been approved. CLOSED: Action 010: main content is available and approved, but some editor's notes need to be resolved (see action 013). CLOSED: Action 004/006/008/010/011: need to analyze and define the relationship of NFV-MANO Service and interfaces. CLOSED: Action 009: main content is available and approved, but some editor's notes need to be resolved (see action 013). CLOSED: Action 009: the "heartbeat" functionality was deleted in the approved FM interface and IE contribution (see NFVIFA(18)000215r2). It needs to be resolved how the heartbeat functionality relates to fault management, or whether it needs a specific interface for it. Status: contributions providing a new interface to handle the heartbeat functionality were available, but they were not discussed. The technical assessment and discussion would be postponed to later IFA031 releases, in order to make sure the completion of a stable version of IFA031 for the Rel. 3 drop #1 (1H2018). CLOSED: Action 011: main content is available and approved, but some editor's notes need to be resolved (see action 013). CLOSED: Action 012: main content is available and approved, but some editor's notes need to be resolved (see action 013). CLOSED: (Jan. 2018) At IFA#84 F2F meeting: discussed the possibility of having some informative information flows to show examples on how the interfaces can be used. An Annex could be added. Status: completed. An annex has been added to add informative information flows. Refer to contribution NFVIFA(18)000449. CLOSED: As captured in some editor's notes in clause 6: Editor’s Note: actors in the operations are “consumer” and “NFV-MANO functional entity”. The consumer is intended to be an authorized consumer, thus, not all possible consumers may be authorized to access all operations. Further description and analysis about this is expected to be part of the “Security Considerations” clause. Status: completed. Additional content was added as part of action 014, and in particular with contribution NFVIFA(18)000578r1. Action 014 (added in May 2018) to list specific security related contributions. VNFs, and re-using ETSI NFV MANO components to perform common MANO tasks on the MEC applications. Delay on MEC side in providing requirements. Feature description The VNF_PHOTO is a feature that has been investigated and described in the published ETSI GR NFV-TST 005. A VNF Snapshot is a replication of a VNF instance at a specific point in time with a corresponding VNF Snapshot Package which is collection of files representing a VNF Snapshot. The feature implementation enables operations on and management of VNF Snapshots and their corresponding packages. 001 Add functional requirements on the NFVO (IFA010 6.2.x) to support granting for VNF/VNFC Snapshot operations, based on Clause 7.2.1 in TST005 (recommendation Nfvo.001). 002 Add functional requirements on the VNFM (IFA010 7.x) to support VNF/VNFC Snapshot operations and VNF/VNFC Snapshot Packaging, based on Clause 7.2.2 in TST005 (recommendations Vnfm.001 to Vnfm.009). 003 Add functional requirements on the VIM (IFA010 8.x) to support virtualized resource Snapshot capabilities based on Clause 7.2.3 in TST005 (recommendations Vim.001 and Vim.002). 004 Add requirement on Virtualised Resources Management interface on the Or-Vi reference point (IFA005 clause 5.3.5) to support attaching/detaching Volumes to virtualized compute resources, based on Clause 7.5.2 in TST005 (recommendations OrVi-Vcrm.001 and OrVi-Vcrm.002). 005 Add new operation for attaching/detaching Volumes, including new information elements, to Virtualized Compute Resources Management interface (IFA005 clause 7.3.1.x), based on Clause 7.5.2 in TST005 (recommendations OrVi-Vcrm.001 and OrVi-Vcrm.002). 006 Add values to the computeOperation parameter descriptions of the OperateComputeRequest and OperateComputeResponse of the Virtualized Compute Management interface (IFA005 clause 7.3.1.6) to support quiescing/unquiescing and reverting to Snapshot virtualised compute resources, based on Clause 7.5.2 in TST005 (recommendations OrVi-Vcrm.003 to OrVi-Vcrm.005). 007 Add value to the storageOperation parameter description of the OperateStorageRequest of the Virtualized Storage Management interface IFA005 clause 7.5.1.6.2) to support reverting to Snapshot virtualised storage resources, based on Clause 7.5.2 in TST005 (recommendation OrVi-Vsrm.001). 008 Mirror requirements from IFA005 towards IFA006, i.e. - Add requirement on Virtualised Resources Management interfaces on the Vi-Vnfm reference point (IFA006 clause 5.3.3) to support attaching/detaching Volumes to virtualized compute resources, based on Clause 7.5.1 in TST005 (recommendations ViVnfm-Vcrm.001 and ViVnfm-Vcrm.002). - Add new operation for attaching/detaching Volumes, including information elements, to Virtualized Compute Resources Management interface (IFA006 clause 7.3.1.x), based on Clause 7.5.1 in TST005 (recommendations ViVnfm-Vcrm.001 and ViVnfm-Vcrm.002). - Add values to the computeOperation parameter descriptions of the OperateComputeRequest and OperateComputeResponse of the Virtualized Compute Management interface (IFA006 clause 7.3.1.6) to support quiescing/unquiescing and reverting to Snapshot virtualised compute resources, based on Clause 7.5.1 in TST005 (recommendations ViVnfm-Vcrm.003 to ViVnfm-Vcrm.005). - Add value to the storageOperation parameter description of the OperateStorageRequest of the Virtualized Storage Management interface (IFA006 clause 7.5.1.6.2) to support reverting to Snapshot virtualised storage resources, based on Clause 7.5.1 in TST005 (recommendation ViVnfm-Vsrm.001). 009 Add a requirement on the Or-Vnfm reference point (IFA007 clause 5.2) to support a Snapshot Package Management interface produced by the VNFM, based on Clause 7.5.3 in TST005 (recommendation Or-Vnfm.001) and Clause 7.5.4 in TST005 (recommendation OrVnfm-Vspm.001). 010 Add requirements on a new Snapshot Package Management interface on the Or-Vnfm reference point (IFA007 clause 5.3.x) to support VNF Snapshot Package operations, based on Clause 7.5.4 in TST005 (recommendations OrVnfm-Vspm.002 to OrVnfm-Vspm.005). 011 Add new Snapshot Package Management interface specification (IFA007 clause 7.x) to support VNF Snapshot Package operations, based on Clause 7.5.4 in TST005 (recommendations OrVnfm-Vspm.002 to OrVnfm-Vspm.005). 012 Add a requirement on the Ve-Vnfm-vnf reference point (IFA008 clause 5.3.0) to support a VNF Snapshot Notification interface produced by the VNFM, based on Clause 7.5.5 in TST005 (recommendation Ve-Vnfm-vnf.001) and Clause 7.5.6 in TST005 (recommendation VeVnfmvnf-Vsn.001). 013 Add requirements on the Ve-Vnfm-em and Ve-Vnfm-vnf reference points (IFA008 clause 5.2.1.1 and 5.3.1.1) to support receiving confirmations upon sent VNF lifecycle management operation occurrence notifications related to VNF Snapshots to enable the continuation or abortion of a VNF Snapshot operation after required modifications in the VNF triggered by the notification. This solution was preferred over and replaces the original intended solution of adding requirements on a new VNF Snapshot Notification interface on the Ve-Vnfm-vnf reference point (IFA008 clause 5.3.1.x) to support VNF Snapshot notifications, based on Clause 7.5.6 in TST005 (recommendations VeVnfmvnf-Vsn.002 and VeVnfmvnf-Vsn.003). 014 Add specifications on the VNF Lifecycle Management interface (IFA008 clause 7.2.x) to receive confirmations upon sent VNF lifecycle management operation occurrence notifications related to VNF Snapshot to enable the continuation or abortion of a VNF Snapshot operation after required modifications in the VNF triggered by the notification. This solution was preferred over and replaces the original intended solution of adding a new VNF Snapshot Notification interface specification (IFA008 clause 7.x) to support VNF Snapshot notifications, based on Clause 7.5.6 in TST005 (recommendations VeVnfmvnf-Vsn.002 and VeVnfmvnf-Vsn.003). 015 Add requirements on VNF Lifecycle Management interface on the Ve-Vnfm-em reference point (IFA008 clause 5.2.1.1) to support querying/deleting available VNF/VNFC Snapshot information and to support create/revert to VNF/VNFC Snapshot operations, based on Clause 7.5.7 in TST005 (recommendations VeVnfmem-Vlm.001 and VeVnfmem-Vlm.002). 016 Add new operations for querying/deleting information on available VNF/VNFC Snapshots and creating/reverting to VNF/VNFC Snapshots, including information elements, to VNF Lifecycle Management interface (IFA008 clause 7.2.x), based on Clause 7.5.7 in TST005 (recommendations VeVnfmem-Vlm.001 and VeVnfmem-Vlm.002). 017 Add requirements on NS Lifecycle Management interface on the Os-Ma-Nfvo reference point (IFA013 clause 5.3.2) to support querying/deleting available VNF/VNFC Snapshot information and to support create/revert to VNF/VNFC Snapshot operations, based on Clause 7.5.8 in TST005 (recommendations OsMaNfvo-Nslm.001 and OsMaNfvo-Nslm.002). 018 Add new values to the updateType for deleting VNF Snapshot information and for creating/reverting to VNF Snapshots and new parameters, including information elements, to the Update NS operation of the NS Lifecycle Management interface (IFA013 clause 7.3.5), based on Clause 7.5.8 in TST005 (recommendations OsMaNfvo-Nslm.001 and OsMaNfvo-Nslm.002). 019 Add Opconfig Information Elements to enable the configuration of LCM snapshot operations (IFA011 clause 7.1.5). 020 Add new events to the LifeCycleManagementScript related to VFN Snapshotting (IFA011 clause 7.1.13). 021 Add a new attribute to the Vdu information element (IFA011 clause 7.1.6.2.2) with a content of a new information element for VNFC Snapshot descriptor. CR draft not required for Release 3 drop 1. 022 Add the specification of a new information element for a VNFC Snapshot descriptor (IFA011 clause 7.1.6.x), based on Clause 7.3 in TST005 (recommendations Vnfsd.005 to Vnfsd.016). - Add requirements on VNF Lifecycle Management interface on the Or-Vnfm reference point (IFA007 clause 5.3.4) to support querying/deleting available VNF Snapshot information and to support create/revert to VNF Snapshot operations. - Add new operations for querying/deleting information on available VNF Snapshots and creating/reverting to VNF Snapshot, including information elements, to VNF Lifecycle Management interface (IFA007 clause 7.2.x). 024 Extend the Grant VNF Lifecycle Operation operation of the VNF Lifecycle Operation Granting interface (IFA007 clause 6.3.2) to support granting of VNF Snapshot operations. - Add a requirement on the Os-Ma-nfvo reference point (IFA013 clause 5.2) to support a VNF Snapshot Package Management interface produced by the NFVO. - Add requirements on a new Snapshot Package Management interface on the Os-Ma-nfvo reference point (IFA013 clause 5.3.x) to support VNF Snapshot Package operations. - Add new Snapshot Package Management interface specification (IFA013 clause 7.x) to support VNF Snapshot Package operations. - Add trigger conditions for VnfLcmOperationOccurrenceNotification for create and revert-to VNF Snapshots to information elements and notifications related to VNF Lifecycle Changes (IFA007 clause 8.6.2.2). 027 Add description on filters and attributes for VNF Snapshot information, including information elements, to the Query NS operation of the NS Lifecycle Management interface (IFA013 clauses 7.3.6 and 8.3.3). - Add requirements on a new VNFC Snapshot Package Management interface on the Ve-Vnfm-em reference point (IFA008 clause 5.2.x). - Add specification of the VNFC Snapshot Package Management interface on the Ve-Vnfm-em reference point (IFA008 clauses 7.X, 9.Y). 029 Add support for requesting transfer of VNF Snapshot Package image artefacts from the NFVO towards the VIM. 030 Add support for granting of VNF Snapshot Package operations. NOTE: An alternative solution for a VNF Snapshot Notification Interface in IFA008 could be to add a new VNF Snapshot notification type to the VNF LCM interface. The final solution will be developed when working on the items for IFA008. After investigation of the alternative, it was decided to implement this alternative by re-using the VNF lifecycle notification interface and adding an operation to enable the VNF/EM to confirm the received notification concerning VNF snapshotting. Feature Prime Stefan Arntzen, Huawei. 002 Specify requirements for the VIM to support the capability for supporting SAL for the assignment/reservation of resources. Specify requirements for the NFVO/VNFM to support SAL for requesting the assignment/reservation of resources. Feature description The VNFCLOUD feature is currently being specified in ETSI GS NFV-EVE 011, the NFVPAAS feature is currently being studied in ETSI GR NFV-IFA 029. The VNFCLOUD will implement mechanisms for the life-cycle management of NFV Micro-Services while NFVPAAS will enhance the NFV architecture to support identified PaaS-like capabilities and cloud-native design principles for VNFs. 002 Update feature implementation request for VNFCLOUD if necessary and create feature implementation request for NFVPAAS. 003 Prepare detailed feature implementation plan. To specify requirements and enhancements to NFV Architectural Framework to support PaaS features. To specify non-functional parameters to classify and characterize VNF cloud-native implementations. During the work on the two work items it was discovered that both features are very much related and the envisioned solutions and implementations might overlap and will target the same impacted work items. During discussions in IFA#73 it was further identified that EVE011, even though it is normative, should be considered as stage 1 requirements on cloud-native on a high abstraction level without taking the actual implementation into consideration. It was further identified in this meeting that IFA029 as a GR looks at architectural aspects of both Cloud Native and PaaS. Impacted WIs Active work items: IFA026, IFA033, SEC019. Future work items: consider whether SOL or TST items would be appropriate. Existing work items: SEC009, SEC011, SEC012, SEC013.